Translate documents in any file format into more than 150 global languages. We offer high-quality document translation services at affordable prices in over 150 languages worldwide thanks to our network of professional document translators. We guarantee word-perfect translations that flow naturally by only ever using native-speaking linguists, and ensuring every file is revised in accordance with strict quality protocol prior to delivery. We offer document translations in a vast range of industries, formats, and file types. From business to finance, engineering to technology, there’s no field that we can’t cover. Our professional linguists only ever translate documents into their mother tongue, ensuring a fluent, natural-sounding result. With our express solutions, we can have your accurately-translated documents back to you within a matter of hours. We work with files in any version of Microsoft Word. We also reproduce tables, graphs and images in the required language. We handle other processing software too e.g. Pages and Google Docs. We handle projects involving seemingly uneditable PDF documents containing images and tables. We can deliver accurate translations in both PDF or another format, depending on your preference. We can handle letters in all formats, whether that be .txt or even an entirely handwritten letter. In addition, we also take care of e-mails, text messages and any other type of correspondence. We take care of your multilingual PowerPoint presentations, maintaining the formatting and animations contained in the original. We also work with other platforms such as Prezi, Keynote, and Slides. At our professional translation agency, we pride ourselves on both the high quality of our ISO-certified document translation solutions and our excellent customer care. We continually exceed our clients’ expectations, which has led to us being the trusted translator partner of some of the world’s biggest brands. Our experienced document translators only ever translate into their mother tongue, ensuring that your translated text reads naturally to native speakers. To ensure each of our clients’ translations is of the highest possible accuracy, all documentation is revised by a second independent native translator. Our translator network spans a broad range of industries so if your documentation requires expert knowledge in the financial or IT industry, for example, we have translators that are fluent in the relevant industry terminology. Our expert approach means you are met with a service that caters to your individual needs. We assign a dedicated Project Manager to you from the moment that you get in touch, who is available throughout the process to respond to any queries you may have. Our certified translation service is the ideal choice for those times when you are required to provide official document translations for your work or personal life. We provide a combination of professionalism, efficiency, and industry-specific knowledge to ensure that you are in the best position regarding your international matters. Getting hold of high-quality, accurate business document translations ensures your company is uniquely placed to make the most of overseas markets. The medical documentation translations we offer embody our commitment to quality, confidentiality, and efficiency. Our expert medicine translators are a perfect choice. As a London-based translation services provider, we guarantee the best quality translations from a truly international city. We thrive in the active environment of the United Kingdom’s capital, providing document translations to individuals and businesses all around the world, never compromising on the quality of our services. The extensive mix of professional, creative, and political networks in London means we have the necessary experience to offer you an excellent quality document translation, whatever your field. Every time you use our services, you can rest assured that your translation will be handled by a carefully selected translator from our network who is perfectly suited to handle the precise elements of your document translation. With the easy access to technology at our fingertips, using free internet translation services for your language projects may seem like the easy option, but only our certified, human translations can guarantee you the accuracy you need. Our bricks-and-mortar translation services in London are the gold standard for professional, experienced translation experts. We know that sometimes you need a translation to be carried out faster than usual. Maybe you have an important conference coming up and need translations of your slides to help you engage with an international audience? Or perhaps you require certified translations of legal documents in order to seal a contract in the next couple of days? Let us know your needs, and we will make sure we adapt our services to fit your brief perfectly. Crucially, signing up for a rapid turnaround translation never means that the quality of your document translations suffers. WHAT FILE FORMATS DO YOU TRANSLATE? Whether it’s a Word, a PDF or an Excel file that you need, we provide an efficient and professional document translation service in over 150 different languages. Our job as a quality translation provider is to take care of the technicalities, so you don’t have to. Our linguists are digital experts and can translate documents and retain formatting across all file formats including multilingual typesetting. Our tech-savvy expert translators ensure that every detail and subtlety of your original document is accurately preserved. As a rapidly expanding global services company working with qualified language professionals, we are the best translation company for cheap translation services. Our certified document translations are high quality. Whether you’re looking for legal translation notarization or certification, Espresso Translations can help. CAN YOU HANDLE SPECIALIST DOCUMENTS? Our expansive network of trained translators specialised in diverse fields means that we are uniquely positioned to guarantee a document translator who is ideally suited to the kind of text needing to be translated. Whether it is a niche specialism that needs spelling out to the wider world such as an medical translation or a well-known concept that has to be accurate to chime with the intended audience, rest assured that our translators will offer the perfect formulation that stays true to the original documentation while appearing fluent and natural to those reading it. Our translators are either generalists, who are capable of translating a broad range of texts from a diverse pool of subjects not requiring expert knowledge, or specialists, whose in-depth knowledge of technical vocabulary in their field allows them to fully engage with your content and to carry out text translations to an excellent standard. While some document translation services only use generalist linguistic experts, we understand the additional need for a high-level working knowledge of the material in question. This dual expertise means that your needs and requirements are always taken into account and form the core of our approach as a document translation agency offering quality document translation. Only ever translating into their mother tongue, our professional translators work carefully to respect the style and tone of the source document being translated as well as the specific needs in the second language. These are skills that we require as standard, so you can be confident that you will receive a document that is best suited to your needs. Being bilingual is rarely enough to ensure an industry-level translator; we actively seek out professional linguists who are familiar with the particular and exacting demands of the art of translation, as well as with the grammatical rules and conventions of both languages. This way, native speakers of the language translated can connect and engage with the translated document as if it were written in their own language. Whatever category your translation project falls under, we are equipped to handle it skilfully and effectively to give you the best possible results. Whether you need a translation from Mandarin to Swedish or from Dutch to Arabic, our experienced translators in over 150 languages are the perfect choice. Their years of training and experience mean you can rely on your translation sounding authentic, natural and idiomatic to readers whenever you use our services. In an age where privacy concerns online are a big issue, we follow strict protocols to make sure that your materials are protected when you use our translation services. We understand that our clients often need translations of sensitive or private materials, whether for personal or professional reasons, and so we make sure that whoever carries out your document translation signs a non-disclosure agreement. What does this mean? It essentially makes sure that your translator is legally bound not to share or disclose any information that may be contained in your document translation. This guarantee is a key aspect of our desire to give you, our client, the best possible experience when you use our language services for your translations. First time using our professional translation services? Never fear. Our easy-to-use contact form lets you fill out the essential details of what you require from your document translation, and our friendly and professional team will take it from there. 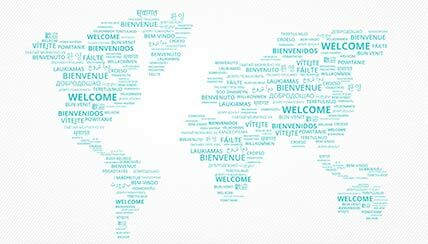 Simply add any questions or important details to the message box, and our translation team will get back to you with a clear and easy-to-understand quote for using our language services.